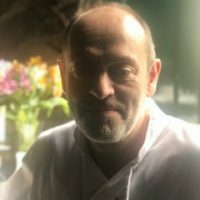 Manchester-born Carlo Coxon was studying economics at City of London University when he started working at the Left Bank restaurant, a small business with the kitchen under the command of Brittany chef Roger Houart. The experience changed his life. He had worked as a kitchen porter from the age of 15 in his local village and learned basic knife skills in a good quality steak restaurant, but his eyes were opened to a new exciting modern french style of cooking. Houart’s instruction provided Coxon with the basics of cooking and food preparation, unlocked his personal ability and instilled a respect for food that is the foundation of Coxon’s modern-Scottish cooking. He left the Left Bank in 1989 when his mentor moved to Spain to launch a restaurant. Coxon received a call from the head chef of his village restaurant who needed a head chef for a restaurant in Manchester called the Piccadilly. In 1991, Coxon and three friends from the Piccadilly struck out on their own and opened the Grain Store in Edinburgh’s Victoria Street, with Coxon in the kitchen. It was extremely hard work, as any money they made went straight in the bank and there was no cash for additional staff; but they succeeded, and in 1995 Coxon bought out the remaining original partners with Paul MacPhail, who looked after front of house. Inspiration? Coxon has developed his favourite dishes over the last 27 years at the Grain Store, but swears by his original edition of Larousse Gastronomique, among others. “Keeping it simple and letting the produce shine is better than anything else,” he says.